Configuring Renoise effect plugins to use an external MIDI controller is by no means a tricky process, but, judging by the number of queries we get from users who've run afoul of it when using our effects, we felt it was worth a short walk-through. The trick with Renoise effects is: when using an effect as a Track DSP, route the MIDI messages to the track effect via an FX Alias instrument. Here we will be using Loomer Shift, our diatonic pitch shifter delay effect VST/Audio Unit plugin, as a Renoise Track DSP. We want to map Delay 1's chromatic Transpose Parameter to our external MIDI controller. First step, add Shift as an insert Track DSP to the desired channel. In the lower pane of Renoise, change to the Instrument Settings tab. 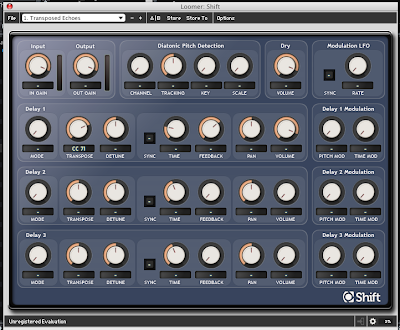 From the AU/VST Instrument Properties, choose Shift from the FX Alias category. Return to the Track DSPs tab, and launch the Shift GUI by clicking "Ext. Editor". 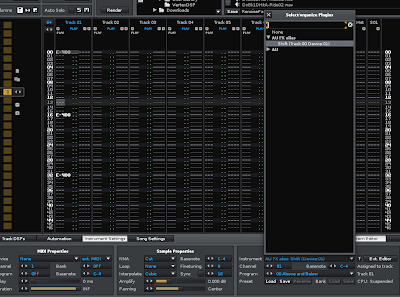 Because MIDI messages are routed (via the FX Alias) to Shift, you should now be able to map the parameters. Under Options, choose "Start MIDI Learn", click on the Shift parameter you want mapping - in this case, Delay 1 Transpose - and turn your controller's knob. The MIDI Controller ID should be displayed in yellow underneath the parameter. You can continue clicking on parameters and turning controller knobs in order to map more parameter. To leave MIDI learn mode, choose "Stop MIDI Learn" under the Options menu. A mapped knob on your MIDI controller should now control its corresponding parameter.